It's the Orca from the terrifying movie Jaws! Limited edition Premium Motion Statue. Non-electronic motion feature brings the piece to life! In the terrifying movie Jaws, the Orca, captained by seasoned shark hunter Quint, was sunk after relentless attacks by a maniacal rogue shark. That action is captured here in a Premium Motion Statue crafted from heavyweight polyresin and hand painted. The integrated, non-electronic motion feature really brings the piece to life! 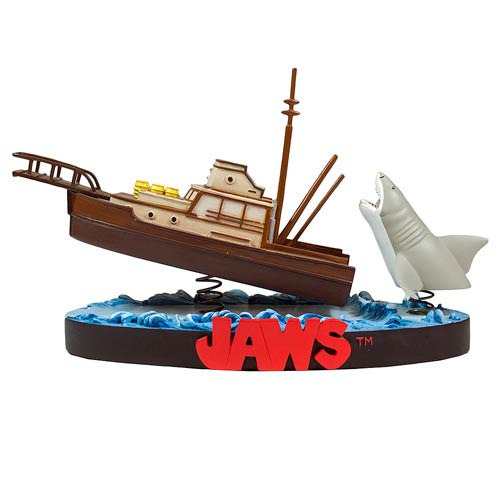 This awesome collectible is a limited edition of 2,500 pieces that comes packaged in a full-color presentation box. It measures approximately 12-inches long x 7 1/2-inches tall x 6-inches wide. Ages 14 and up.